Will AmazonFresh Kill Online Grocery Startups? Will AmazonFresh Destroy Its Competition? AmazonFresh is expanding its online grocery delivery service to Los Angeles – but brick-and-mortars and other online delivery startups say the service just can’t compete. Internet retail king Amazon launched its online grocery delivery service this week in Los Angeles. The service, known as AmazonFresh, has been operating in Seattle since 2007. To use AmazonFresh, consumers need to pay a $299 annual subscription fee, plus an additional delivery fee for orders under $35. To get same day delivery, orders need to be placed by 10 a.m.; orders submitted after 10 p.m. will be delivered by 6 a.m. the next morning. Online grocery startups in Los Angeles say they aren’t worried about competition from the $123 billion ecommerce giant in the estimated $6 billion industry. Yummy – which makes more than 20,000 deliveries per month – fills orders in as little as 30 minutes for a low price. “We’re not designed to change your shopping habits,” says co-founder Barnaby Montgomery. Yummy charges $3.99 for delivery, and the minimum is $17.50. Montgomery says Yummy is able to fill orders in half an hour – and keep costs low -- thanks to its four supermarket locations that are owned and operated by the company. 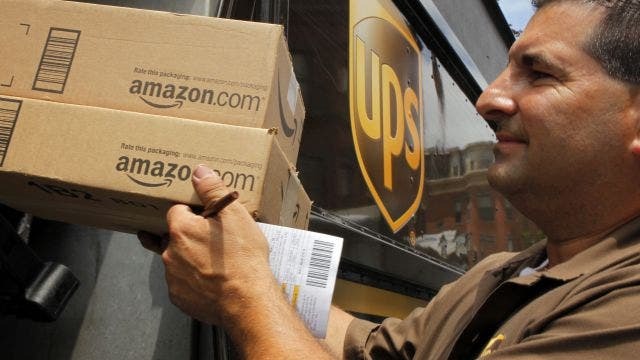 He says the 30-minute delivery window is a “compelling value proposition” that Amazon at this point can’t compete with. He says he’s seeing fewer and fewer customers shopping once a week for groceries, and instead most visit a store about three times a week, buying enough food for only a couple of days. L.A.-based We’ll Get the Food CEO Mark Besada says the company is focusing on the gourmet grocery market, filling orders with food from Trader Joe’s, Whole Foods and local L.A. chain Bristol Farms. They charge $8.95 for deliveries, regardless of order size. Montgomery and Besada both say AmazonFresh could actually be good for business – by educating consumers and proving that online grocery shopping is an important market. And as Yummy looks for a national grocery retail partner to use the company’s proprietary order-fulfillment software, Montgomery is hopeful that Amazon’s entry into the market will prove the importance of online shopping options for conventional grocers. “This is the way people want to order their products,” he says. Competitors in other markets say Amazon’s warehouse model would have a hard time competing in their cities. In Minneapolis/St. Paul, Gopher Grocery has more than 10,000 customers and has been delivering groceries for seven years. Founder Billy Orkin says he believes smaller cities wouldn’t be able to produce enough revenue to support a giant AmazonFresh-sized warehouse. “We rely on a quarter of one grocery store to reach profitability,” he says. Orkin says Gopher Grocery, which charges $2 fees for a minimum order of $50 (delivery is free over $100), is growing by 15 to 20% a year. “We’re looking to expand in smaller regional markets in the Midwest, like Des Moines and Kansas City,” says Orkin. East Coast service Peapod, which operates in 13 states, 24 U.S. markets and has filled more than 23 million orders, says it views AmazonFresh as “a serious player,” but not one that will shake its footing --given its partnerships with supermarkets like Stop & Shop and Giant Food. “We have a demonstrated record of experience in addressing the specific challenges of building an online grocery store, and we have the luxury of being able to tap the grocery expertise from our sister supermarket companies,” said a Peapod spokesperson. Elsewhere in the country, online grocers are attempting to capture niche markets, as well as try out new approaches to logistics issues. Apoorva Mehta left Amazon in 2010 and two years later launched Instacart, which operates in Northern California, serving San Francisco, Oakland, Berkeley and Palo Alto. While with Amazon, Mehta specialized in supply chain logistics. Mehta says the innovation that will help Instacart succeed is crowdsourcing; the company uses a fleet of 200 independent contractors as “personal shoppers” who, using their smartphones, can fill orders from local stores. Thanks to these personal shoppers, Mehta says the company can provide 1- and 2-hour delivery. “We launched seven months ago, and we estimate that 10% of some individual stores&apos; revenue comes through us,” he says. In the mid-Atlantic, Relay Foods says it hopes to capture the market of shoppers who want local and organic food – the “Community Supported Agriculture” or CSA crowd. Founder Arnie Katz says the company’s emphasis is on “local foods and local artisans,” filling orders directly from farmers. There are no subscription costs for Relay; users can pick up their orders with no fee at specified locations (known as “Relay spots”) or have them delivered to their home for a $10 fee. Katz says his clientele is separate from those who would be interested in AmazonFresh, but thinks the company’s entrance into the industry will benefit other startups. “National vendors will pay more attention to the online grocery space,” he says. And one new player, MySupermarket.com, takes it one step further: Founder Allon Bloch says AmazonFresh’s expansion would be a great thing for his company, which hopes to be the “Kayak.com of groceries” – an aggregator that helps consumers get the right price. Already a success in the U.K. and Israel, MySupermarket.com is launching this week with only non-perishables in the U.S., but says AmazonFresh, by bringing more choice, will help their model succeed. “We view retailers as content providers, so the better they are, the more choices we have,” says Bloch, whose service already aggregates some products from Amazon Prime.